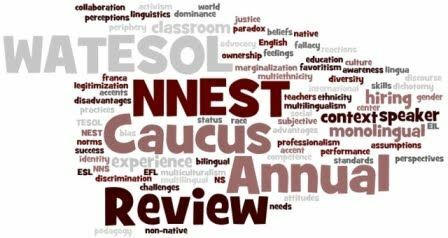 The WATESOL NNEST Caucus Annual Review is a professional, peer-reviewed journal that welcomes submission of previously unpublished articles on topics of relevances to the Nonnative English Speaking Teacher (NNEST) research or research on the acceptance and instruction of World Englishes. Because the Review is com submitted to publishing manuscripts that bridge the gap between theory and practice, the Review encourages submissions drawing on recent research in a variety of research disciplines (e.g., education, linguistics, applied linguistics, cultural studies, and language acquisition) and addressing the implications and applications of this research to NNEST studies or advocacy. Brady, Braine, Lee, Akikawa, Yan, Park, Shin, Lipovsky, Mahboob, and Selvi.